Load all of your beads onto the elastic. R1: ch 4, sl st to first ch to close round. R2: chain 20 (add more stitches for a larger ring, leave some off for a smaller ring). Sl st to the 2nd ch of R1 (or whatever stitch is on the opposite side of R1 from the chain). Fasten off. Weave in ends (which there isn't much space to do, I just tied it in a surgeons knot and used my crochet hook to weave it between the beads a little.) Snip off any extra elastic. And don't forget to send me a postcard from Vegas! 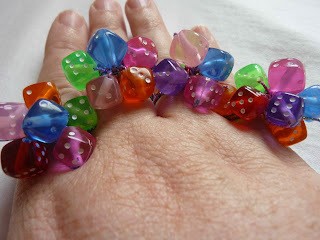 I totally love these :) I used to be a dice dealer back when female dice dealers were all but unheard of. I am totally going to make at least one of these for my DIL, she is a multigame dealer but mostly she deals dice. Thanks for another great pattern and project! Hi Sylvye! Wow, that's so cool!! My uncle was a blackjack dealer, but a dice dealer sounds like more fun!